The 7"-release features a black and white group-shot (Magne, Pål and Morten) (the guys are in front of a mirror and Morten is supposedly the one pressing the remote picture release-button) by Larry Williams. 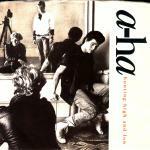 The black a-ha-logo is printed vertically on a cream-coloured background to the upper right of the photo, while a red print of the "hunting high and low"-title and an additional black print of "(remix)" is placed in the lower right section of the picture sleeve. The reverse with a white background features song titles in red, additional information in black and a small picture of the album. Once again Alan Tarney is responsible for the additional production of the orchestral remix (3:48). 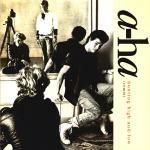 The flip introduces a different, "Demo Version" of "The Blue Sky" (3:10) produced by a-ha. As with most UK releases, 7"-records exist in a variety of label-colours including white, silver, gold and blue. A tasty and inexpensive item for the avid collector is an a-ah misprint. 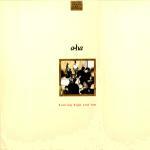 The 12" offers a similar picture sleeve to the 7"-release with the exception that all tracks are listed on the front. The additional "Extended Version" (6:02) has received additional production by Alan Tarney. This 12"-release also comes in limited edition sets of three records (available separately) including individual personality posters. Each item has a sticker signifying whether it is record 1, 2 or 3 of the set. Another collectable is a 12" picture disc (10,000 copies pressed) featuring the same tracks as the regular 12" release. The disc has a multicoloured "World Tour 1986 / 1987"-side with a map of the world. A white a-ha logo on black background plus the sites and dates for all the concerts of the tour circle the map in white and red. The flip side features the same photo as the single releases, placed in a rectangle in the middle of the disc on a cream coloured background. 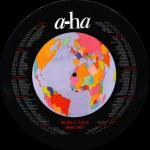 Information about the songs is printed in a similar fashion to the 7" and 12"-releases in black and red round the outside of the picture and the red a-ha-logo is placed at the top. There is a World Tour promotional only 12 " picture disc which comes in a gatefold grey and white sleeve. More details to follow. Australia: The sleeve of the 7" has "Hunting High And Low" written in black instead of red and does not mention the remix. The reverse of the sleeve is white with all the text in black written in the bottom right quarter of the sleeve and does not feature a picture of the album "Hunting High And Low". It has an orange "Reprise Records" label. Brazil: There is a promotional Brazilian 12" which comes in an orange wea sleeve. 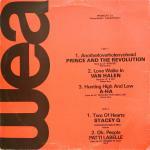 As well as a large black wea-logo on the front of the sleeve, there is also a list of the featured tracks: Anotherlovenholenyohead PRINCE AND THE REVOLUTION / Love Walks In VAN HALEN / Hunting High And Low A-HA // Two of Hearts STACEY Q / Oh, People PATTI LABELLE. The sleeve is the same both sides. Canada: The cover of the 7" is similar to the Australian edition (see above), but the tracks differ with the album version of "Hunting High And Low" (rather than the remix) and the "Demo Version / Original Version" of "And You Tell Me" (1:51) (rather than "The Blue Sky"). The reverse of the sleeve differs slightly due to the difference in tracklisting, in fact only the title track is listed on the reverse of the Canadian sleeve. The promo edition of this 7" single comes in a WEA Canada sleeve. The 12" release is similar to the US 12" (see below). France: The 7"-single has a slightly different sleeve layout compared to the UK edition. The same picture is positioned in the bottom left corner of the sleeve and there is a light cream strip across the top and down the right hand side. 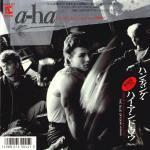 There are two red a-ha-logos, one along the top in the left-hand corner, the other down the side in the bottom right corner. The title is written in lower case black letters in the top right of the sleeve with the text "(remix)" in red underneath. The reverse has a similar layout to the UK edition. The 7" has an orange Reprise Records label. Italy: The 7" doesn't have "remix" written on front of sleeve, it is similar to the Australian 7" except that "Hunting High And Low" is written in red instead of black. The reverse of the sleeve is the same as the Australian 7". Once again the Japanese edition stands out in the crowd. The picture-sheet offers the same black and white photo which was used for the album "Hunting High And Low", while information on tracks is printed on top of it in the colours of black, red and white. The a-ha-logo is grey with light green edges. The reverse features a small group-shot, in addition to an even smaller shot of the album plus lyrics in English and Japanese. The record label is "Reprise Records" like the Japanese 7" of "Train Of Thought". There is more than one pressing of this Japanese 7" release: some copies come with the playing time printed on the label (both sides) plus some additional Japanese writing below and some copies miss it. New Zealand: The 7" is the same as the Australian release and the 12" is similar to the U.S. release (see below) but with additional text on the reverse of the sleeve stating "Marketed by WEA Records Limited PO Box 2915, Auckland, New Zealand". 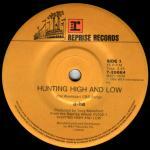 The Philippines: There was a special limited 12" release of "Hunting High And Low" in The Philippines. It comes in a blue and yellow WEA text sleeve with "12 Inch Maxi Single" printed in the top left hand corner whilst there is a red-tone sticker featuring an a-ha shot plus additional information in the top right hand corner. This 12" features the "Reflection Mix" of "Train Of Thought" in addition to the "Extended Remix" of "Hunting High And Low" and the "Demo Version" of "And You Tell Me". Portugal: The front sleeve is similar to the UK edition, the back sleeve is printed in black and white rather than colour. USA: The 7"-release is similar (in both track listing and sleeve) to the Canadian release, but the title is printed in red rather than black on the front and reverse. There is also a 7"-promotional record which comes in a similar sleeve but has the Remix of "Hunting High And Low" on both sides of the disc. The 12" features an identical picture to the UK release. However, it is much smaller and placed in a brown, "wooden" frame on cream background. 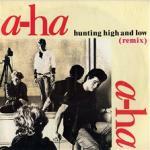 A small black a-ha-logo is directly above the photo while "hunting high and low" is printed in red below it. In addition there is a small wooden square in the top middle position with the words "Specially-Priced Maxi-Single" printed in black. The reverse has the same wooden look with a negative print of the small photo presented on the front. Additional information is written in red and black. Instead of the 7"-remix version of "Hunting High And Low" this record offers the "Reflection Mix" of "Train Of Thought" (7:00). This track, produced by Steve Thompson and Michael Barbiero is the same as the extended version found on the UK 12" of "Train Of Thought".